In 1999, we first heard of Medjugorje as to be aware of what we were hearing. Gene & I were discussing what to do for our 50th anniversary in 2000 on this Sunday and before mass we were in the vestibule looking at the new St. Elizabeth Ann Seton statue, when the man, whom we didn't know at the time came up and put a note in Gene's hand. It said to write to Wayne Weible for his newspaper on the Miracle of Medjugorje. (By the way, this man works constantly for our lady to make known Medjugorje and he's never been there). We did that. Gene started reading the paper one day and I would guess that he had only read it for 20 minutes then he looked up and said to me,"We need to go here". ( He always said he would not go to Europe). I was dusting. I sortof glanced and said "yeh, right", then I looked and he looked very serious. I said,"Are you serious?" As soon as I saw his expression again, I knew that something wonderful was happening to him right then. I am a convert. However, I am the one who prayed the rosary every day for years and years. I loved Blessed Mother from the very beginning of my conversion and she had a very special place in my heart and life. Magazine on a Married Couples Retreat Pilgrimmage and it couldn't have been more perfect for our 50th anniversary. Our group got the special marriage blessing from Fr. Jozo holding the crucifix. This was very moving. Since the first trip, our two kids have come back to the church and are very close to Our Lady. Our daughter went to Medjugorje and was there during 9-11. She has fibromyalgia, but her faith is making it much easier to deal with. 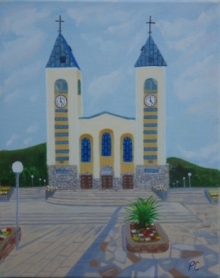 Our son has had much pain in his personal life and his newly renewed faith has done wonders in helping him through this He would love to go to Medjugorje, and when Blessed Mother decides, she will make it possible.This is much too complicated to relate but our lives have been completely changed with this first trip to Medjugorje. We took our 2nd trip to Medjugorje the last week of April of this yr. and came home May 3rd. after witnessing Marijana's apparition on the 2nd of May. We have that apparition on tape. We stayed at Marijana's and she gave us a talk and personal interview for our group and it was great. We saw another miracle of the sun after Marijana's apparition walking out of the area where the apparition was but it was different this time with the rainbow starting at the top of the sun, but then we walked on (it was very crowded and Gene was ahead with a small suitcase with blessed articles) when I looked at the people standing on the short wall around the area and they all had yellow circles on their faces, then I looked at the sky and little suns were pulsating around the sky and shining on the faces of the people making them yellow. I yelled at Gene to look at the sky and when he turned around, he had the yellow on his face and top of his head. There was a large crowd and they were very pushy trying to get out of the area. Ordinarily, I would have possibly been panicked but I knew Blessed Mother and Jesus was with us. We didn't make it up Cross Mt. in 2000, so Gene decided that, no matter what, he was going up Cross Mt. It was very warm that day. Gene had just had carotid surgery in Feb., so I was a little skeptical, but I knew that if he wanted to go that Blessed Mother would help him. We told the group to go on that we would just take our time and go up. We had a little angel in the group, Cynthia, from Pa. who insisted she stay with us and show us the way as she had been up many times before. She did. About the 3rd or 4th station, I looked at Gene and I wasn't sure he could make it, but I ask him and he said he was going to the top. I started praying for help and Cynthia was giving us pep talks and we would rest at each station and in-between. As we neared the top, it seemed to get easier and when we got to the top, we had this very refreshing breeze and recuperation of body and spirit that is indescribable. It took us about 2 1/2 hrs. to go up and about half that time to come down. We had a couple of angels helping us down, mostly just watching to see if we were o.k. We got cheered by the group when we got to the top and again when we got back to Marijana's in time for dinner. The amazing thing is that we weren't tired when we got back as we thought and we weren't even sore the next morning. Amazing graces from Blessed Mother and Jesus. Gene was determined to get to the top of Cross Mt. to let Blessed Mother know that she led him to her Son and he wanted to prove it to her. We attended the Christ the King conference in Colo. Spgs., Colo. for our anniversary this year on Aug. lst. and this was very interesting and rewarding, also. My birthday is the day after Blessed Mother's, so we celebrated all the wonderful graces and blessings together.